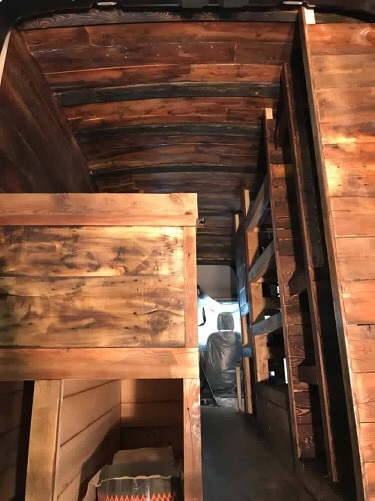 How many people can say that they've built a cabin in a van and that they did it with wood that is a hundred years old? Clinton Pigeon and his team at Two Birds Furniture in Okotoks rose to the occasion to help the Traveling Cowboys with the final step in the build of the Two Cowboys production van. 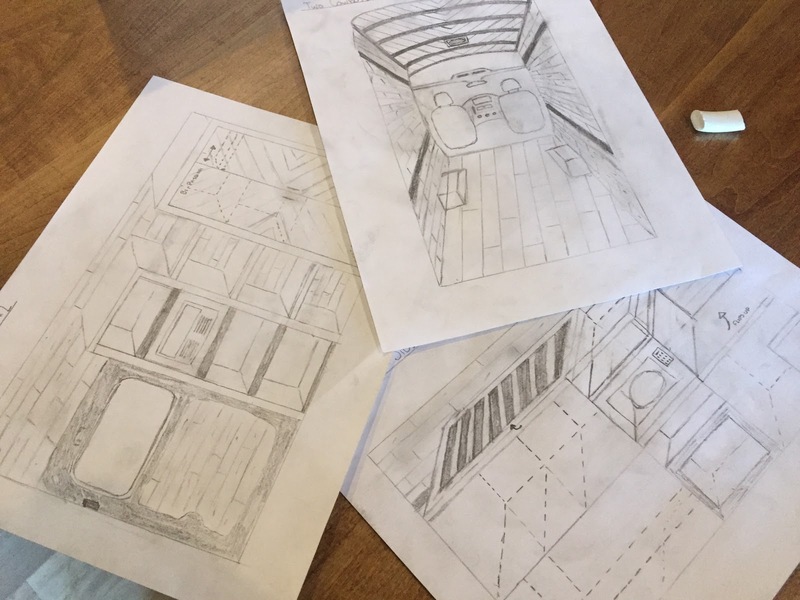 The brief was to create a comfortable work and living space within our Ford Transit that can accommodate our travels in all-weather circumstances. We want to take our studio on the road as we crisscross North America to feature destinations, communities, makers, and entrepreneurs all over the continent. 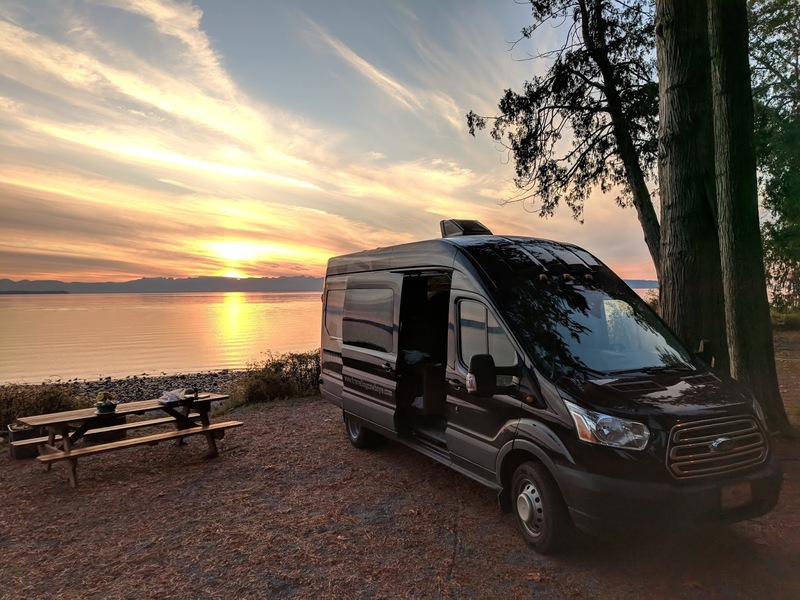 The van is an essential item in our fleet that includes a Sprinter van from Leisure Vans, and an A-Class RV from Holiday Rambler that we purchased from Guarantee RV. The objective of the construction of our production van was that it should allow for enough storage for all the production gear. It should be comfortable for long trips away from home. Ultimately, the project should showcase some of the best of Alberta's craftsmanship and the rich history of our area. We think the Two Birds succeeded in doing it! 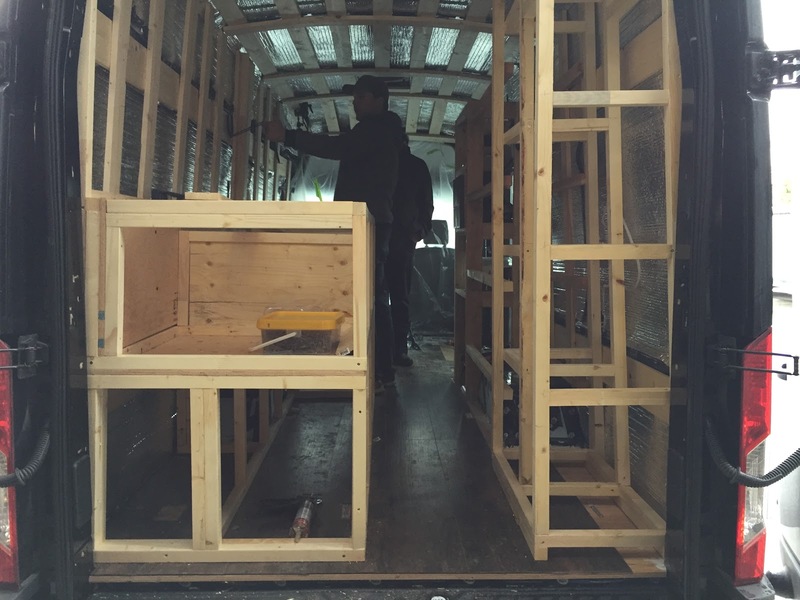 The Two Cowboys production van is a project that's been in the works for most of 2017. It started with the support of Cam Clark Ford helping us to procure a Ford Transit 350HD van in the early parts of summer. The next big task was to install the required solar and battery power for the studio's equipment. Bucars RV stepped in to install solar, controllers, inverter, batteries and ventilation for charging our high-end camera gear and for operating our sensitive computer equipment, while on the road. A business' vehicle is an ideal billboard for advertising. Spy Designs in Okotoks helped with an eye-catching branding design and applied the vinyl graphics so that everyone can identify the van on the road. Canada throws all kinds of weather at you and the van needed to be insulated and heated for weather that can go between extremes of -35C and +40C. 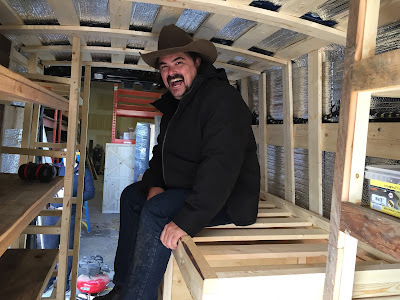 The insulation task fell on the shoulders of resident Cowboy, Braam Compton, who spent weeks researching the ideal solutions and several weekends installing it over the hot summer months. A vital part of the insulation journey was getting the required window coverings to trap heat inside or keep the hot sun out. We sourced custom window screens from Solar Screen in Australia. 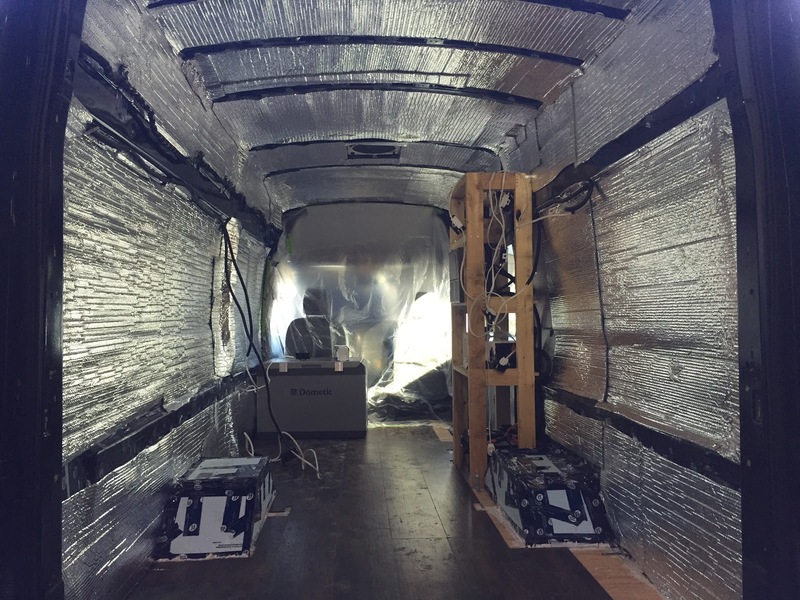 The Espar Airtronic gasoline heater installation was done by Polar Mobility Research in Calgary. Once all the "invisible" installations were out of the way, the Two Birds had a chance to work with us on the layout. Wood framing provided the structure for the arrangement. 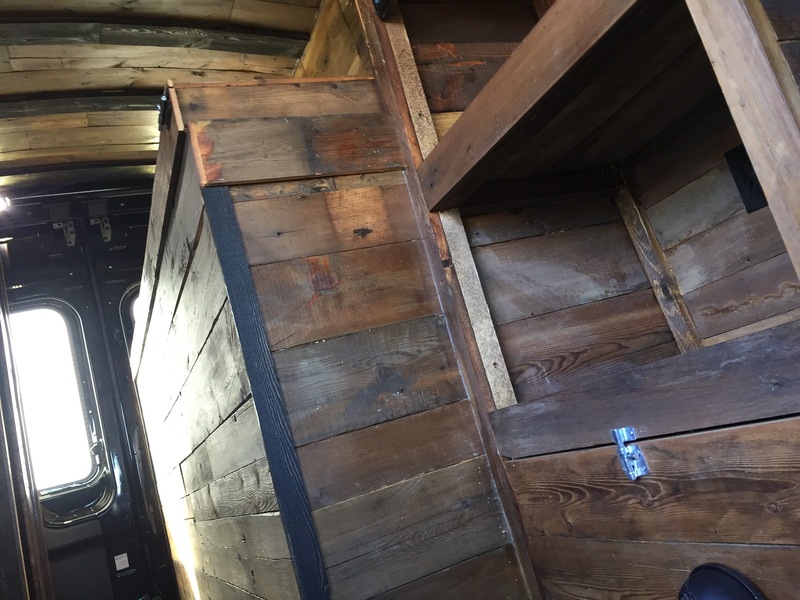 The framing was then clad with reclaimed timber sourced from an old Alberta barn. The design accommodated a work desk, fridge, shelving, closet, drop-in storage and a single bed for when a day gets too long. A van is an invaluable business tool for our line of business. 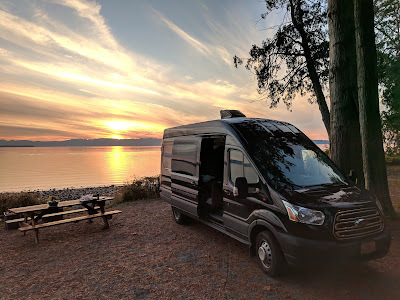 A well-designed and properly-constructed vehicle makes our day easy and allows us to reach the many destinations we cover and to work on the road while away from home base. We learned a lot with the build of this first one and did not doubt that there will be subsequent projects with improvements in our design and construction approach. The most significant lessons we've learned from our project is how valuable the people are that committed to helping us with it. All of the businesses that contributed are patrons and supporters of the Two Cowboys mission. We gladly promote them at every opportunity we get. We appreciate their help to keep us on the road for telling the stories of our people and inspirational businesses in our local communities. We are extending a sincere word of thank you in particular to the Two Birds for putting in days, nights and weekends to finish the project before winter finally arrived. We can now look forward to many miles and many more inspirational stories on the road. If you want to know how exactly it was all done, then please consider becoming a friend of ours on Patreon. We will give you all the details of what to do, and what to avoid if you contemplate a similar endeavour. We may even help you with your project if you ask nicely. We earn our livelihood by producing great content and supporting inspiring people, businesses, and communities. We use Patreon to help us gain from our work. Please become a patron at http://www.travelingcowboys.com if you want to see more of this and other stories.